I think the only gaming community I’ve ventured into that complains more than the Minecraft community is the Diablo 3 community. I mean- I like both of the games, but Diablo could use more of a feeling of accomplishment in the endgame, and Minecraft could use more monsters. I love Mo’ Creatures for this reason. 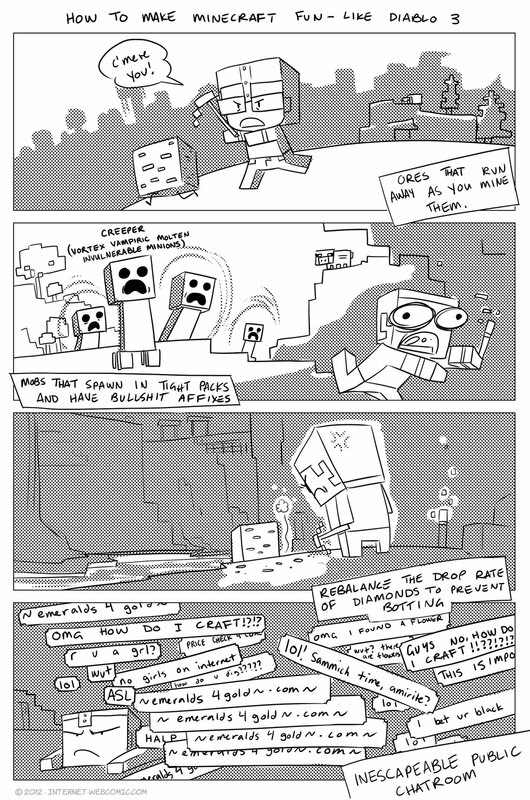 I hope Mojang gets the modding tools into the next update (not frickin’ likely in my opinion). I think I’m done with Diablo though. It’s no longer a game, it’s work- and if I’m going to go to all the effort of work, I might as well do the tonnes of work that stands between me and restful slumber. Maybe I’ll come back to it in a year so I can try my hand at being hopelessly outgeared in PvP. Have to agree with every point you have made. Also, I stopped playing the game when faced with playing through a crappy story for the 4th time. Oh well.